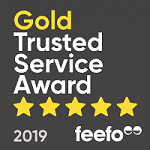 We're so proud to have achieved Feefo's prestigious 'Gold Trusted Merchant' award in 2017, 2018 and 2019, given only to businesses with a 95%+ service rating. Read candid, independent reviews from parents already using our 5-star service (click 'Read all reviews' below). You can also watch review videos from our parents and children here.